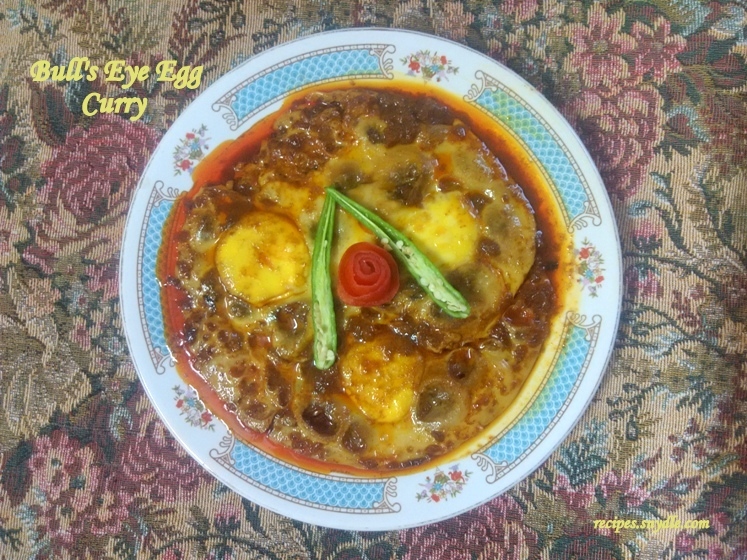 How to make Bull’s Eye Egg Curry/Dum Egg Curry with step by step pictures. Hi foodies! If you are bored with the boiled eggs curry here is a change for you. 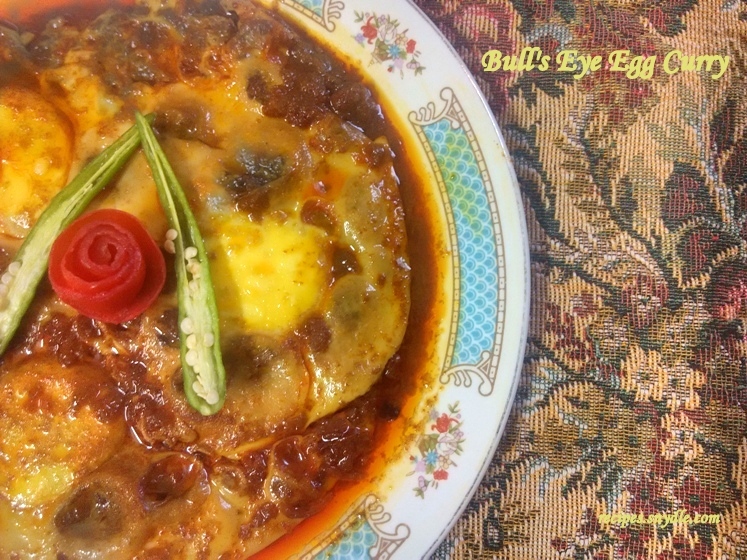 I am sharing my mother’s mouth-watering bull’s eye egg curry recipe with you. 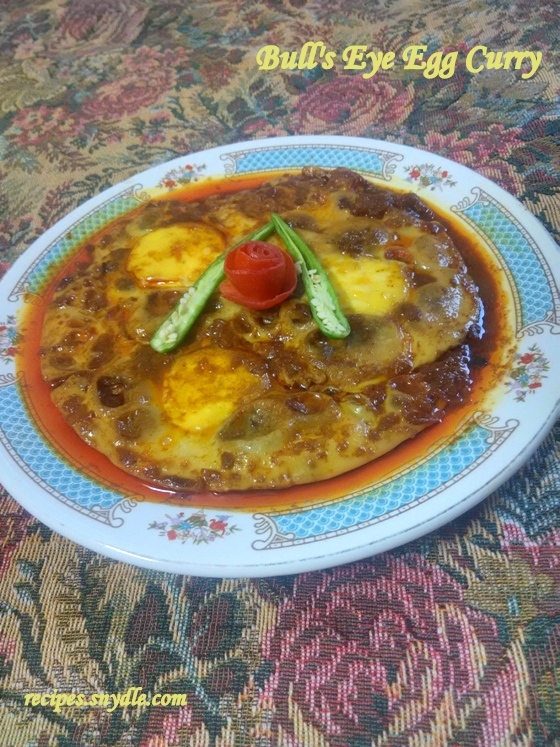 I am sure you will like this version of egg curry recipe for dinner. This egg curry is without coconut milk. In an egg curry normally we use boiled egg but in this recipe the eggs are gently place on the masala and are cooked for 15 minutes on low flame. For the reason that the eggs are cooked on dum and it gets zest with the masala. 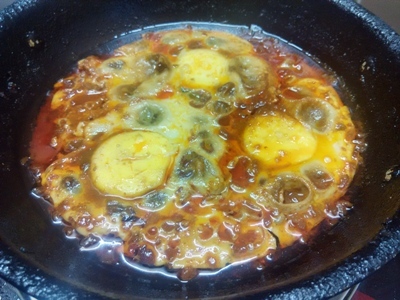 It is similar to the simple egg curry recipe. 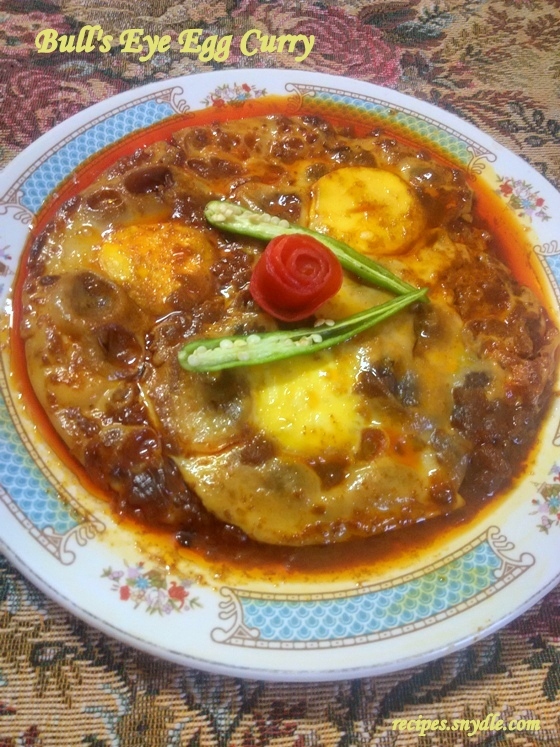 If you have not tried this recipe yet, I think you must try it and I am sure you will like it. This bull’s eye egg curry recipe/dum egg curry recipe contains few ingredients and requires less effort to prepare. It is a simple egg curry. Fenugreek seeds give good aroma to the curry. I have mixed coriander powder and garam masala powder before hand and then added to the skillet. You can use any readymade garam masala or curry powder to make bull’s eye egg curry. Kashmiri red chili powder can also be replaced with the normal red chili powder that will enhance the curries color. 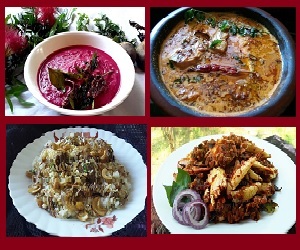 We regularly have meat curries and chicken curries. So this recipe will be a rescue from the other non-veg curries or the veg curries. 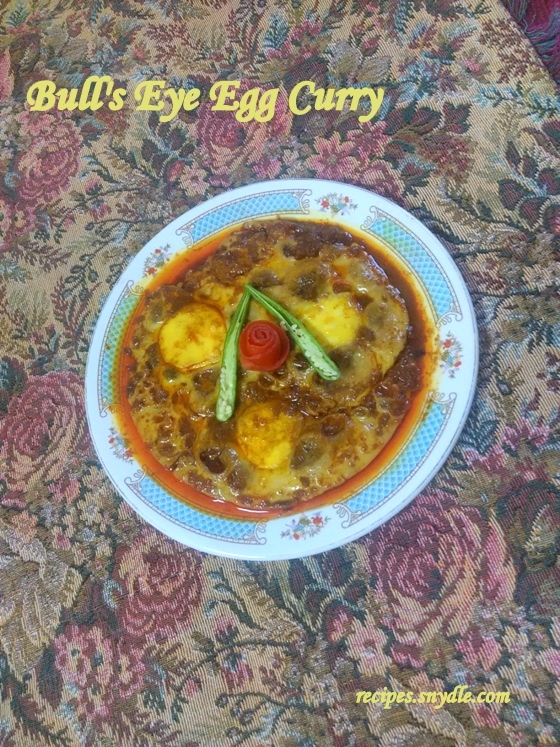 Bull’s eye egg curry/dum egg curry can be had with chapattis/Indian bread or with jeera rice. This curry has thick consistency. Do not add excess water to the curry that will spoil the curries taste as it is an egg curry dry recipe. Be careful while placing eggs on the curry. 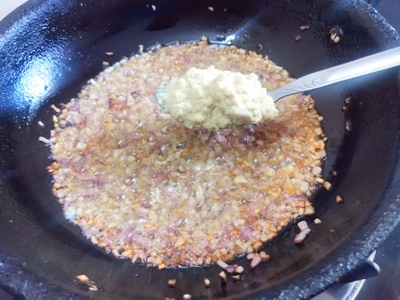 Place the eggs on the eggs gravy in different spots for the reason that the eggs don’t overlie. Hold your hand close to the curry and gently place the eggs into the curry without breaking egg yolk. This recipe of Bull’s eye egg curry recipe yields 2 servings. How to make Bull’s eye egg curry/Dum egg curry. 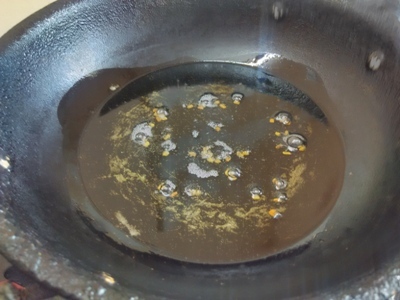 Heat oil in a skillet on a high flame. Add fenugreek seeds/methi dana to the hot oil. 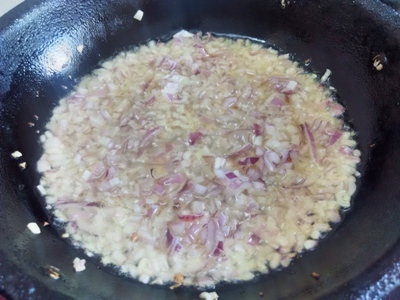 When the fenugreek seeds become golden brown, add chopped onion and stir well till it gets golden brown. Add ginger and garlic paste. Mix it well and stir for 1 minute. 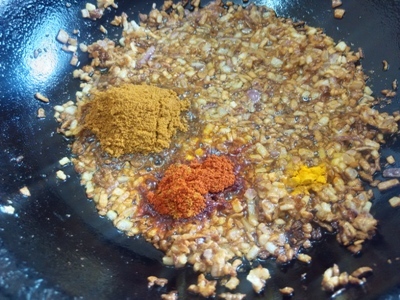 Add red chili powder, coriander powder, garam masala powder and turmeric powder. Mix it well. 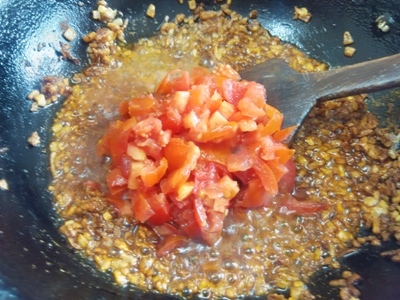 Here I have mixed coriander powder and garam masala powder before hand and then added to the skillet with other spices. You can also use curry powder. 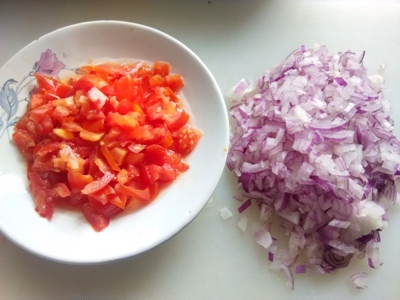 Add chopped tomatoes and salt to the masala and mix well. Reduce the flame to medium. 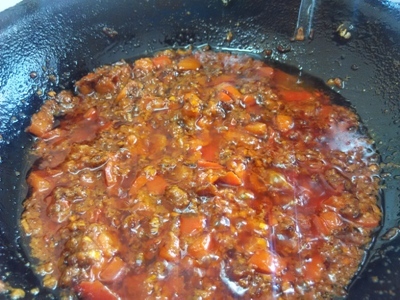 And allow the tomatoes to cook completely. 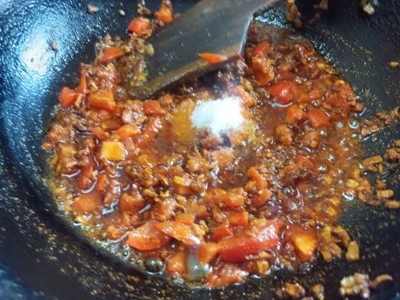 Add ¾ cup water to the masala and mix it well. 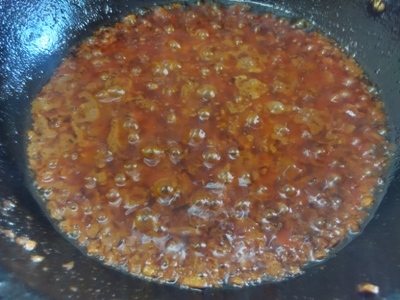 Stir till the masala starts leaving oil. It is sign that the masasla is ready. Now add eggs to the masala. Break the egg from the middle and gently place it directly on the masala on three different spots and hold the eggs close to the curry. Be careful that the egg Yolk does not breaks as we want the whole egg Yolk on the masala. Do not stir after adding eggs to the curry. 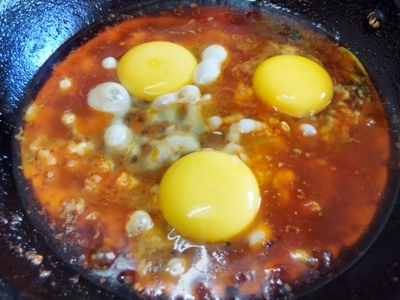 Now cover the skillet with the lid and allow the eggs to cook for 15 minutes on low flame till the eggs are cooked completely and looks like bulls eye. The egg curry is ready to eat. Decorate it with split green chili and flower made of tomato peel. Enjoy!